Sometimes a Toronto Fringe show goes on to fame and fortune outside of the fringe circuit. Last year it was Kim’s Convenience. This year it could be The Wakowski Brothers. This is a play that should go on to bigger and better things. It’s not the show I was expecting based on the program blurb. I thought it would be “a little song, a little dance, a little seltzer down your pants”. There was a lot of song and a lot of dance, no seltzer, a pie that didn’t get thrown, and a fairly complex story in between the vaudeville bits. I wasn’t the only person who was surprised, and impressed. The buzz in the washroom after the show was all about how terrific it was, and how it was so much more than people were expecting.In the program the show is listed as a comedy and a musical. Sometimes it’s hard to fit things in a box. I’d describe it a s a dramedy with singing and dancing. And puns, lots of puns. (Those are in the vaudeville bits.) It’s very funny but it’s also serious and touching. The Wakowski Brothers were a successful vaudeville act. They haven’t performed together or even seen each other for 8 years. They’re back together for one last time for a reunion show. We learn about them and their lives and careers through their conversations with each other and with Caitlyn Rose – who was once married to Jim Wakowski – in between their vaudeville numbers and through flashbacks. The story is a bit predictable but playwright Wesley J. Colford doesn’t give in and provide a musical cliche happy ending. Good for him, it would have spoiled the piece. 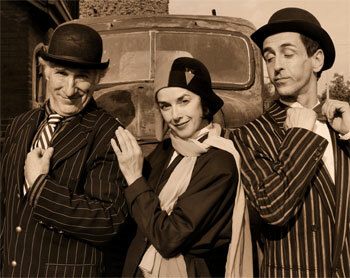 The cast – Derek Scott, Duff MacDonald and Lorretta Bailey – is terrific, singing and dancing up a storm. They seem to be enjoying themselves on stage, something that makes for great energy. I loved The Wakowski Brothers, it’s a definite must-see show. If you miss it at the 2012 Toronto Fringe you’ll probably be able to see it at The Winter Garden after Mirvish picks it up. The tickets will be more expensive though. I agree totally! Not just one of the best fringe shows I’ve ever seen, but one of the best shows ever. This could go on to be huge. Go see it!!! This was a fun show with very competent performers. I really enjoyed learning about the Canadian Vaudeville history. The show could use some tightening, through both script editing and pacing of the performance. This show wins the annual over-hyped show of the Fringe Award. This show is corny, tedious, repetitive and cliche. The music and comedy are weak. ( This show would have been done better by the Oddville Stage Company who specialize in period comedy.) This show has no depth, too bad its a great topic. On a positive note Lorretta Bailey was well cast and could sing.